Probably the best selling point that Titanfall 2 had for me was the grapple hook. It offered a unique gameplay element that no other game had. 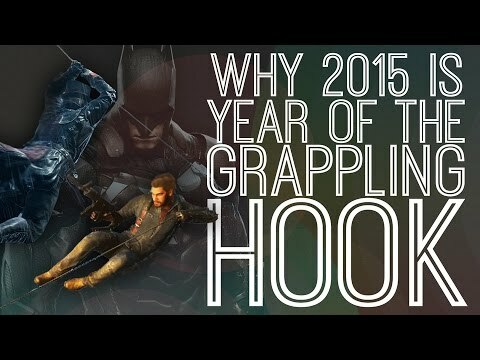 But recently you guys put out the October patch which ruined grapple hook to the point where it is simply unusable. It can no longer be used for any of the great purposes that it had before like; jump boosting, anti titan combat, advanced maneuverability in mid air, or even doing what it is designed to do which is simply getting around the map in a timely manner. Now the absolute best you can hope for is hooking another pilot, or extending the length/height of a single jump every ten seconds or so. I think a lot of people would agree that grapple should be returned to it's previous state. And if it is a balance issue, could you guys simply increase the effectiveness of other abilities. I think that making a lot of people happy for the sake of balance is a lot better than making a few people unhappy for the sake of balance, any way you put it. So at the end of the day, could you great people at Respawn at least make the grapple a little more functional than it is, if not fix it entirely. Tips and tricks is not the best place for balance discussion. Regardless, you can do everything you could do with two charges aside from chain moves, and even then small uses will still drain less. Grapple feels more in-line now. It was a bit too versatile pre-patch. While I don't feel it's perfect, it's better than nothing. The other abilities are already really good, it's just people don't give them a chance because they're so used to playing with the capabilities offered by grapple that they feel 'bad' relative to that point of comparison. Any tactical ability in games that boosts mobility is better than those that don't because it gives the player more tactical options in their mechanical tool box, I remember Halo 4 had a similar issue with jet-pack and thruster armor abilities out-shadowing other abilities; hence why halo 5 made thrusters default and removed jump-jets because they could basically 'break' map design. So @Dinorush13 is right in that you can do everything you previously could. Only difference is now if you use up your whole grapple energy to slingshot you need to wait twice as long to recover. This is fair, those I do feel like it's a bit long so would be nice if the cool-down rate was slightly increased. I'm also not sure how you could even make the other abilities 'better'; unless you made grapple a default ability (I wish this is considered for TFall3). You do not need to take twice as long to recover after each grapple. It's more technical than that; if you were to use both charges prepatch, you would wait 16 seconds to use it again, whereas you need to wait 10 seconds now. However, if you're talking one charge use, you could use the second charge off a fresh bar immediately, while you'd have to wait ten seconds with the new grapple. Overall grapple is basically the same, the difference now is that people who use it to get more than one extra jump from a wall can only use it once and people that would slingshot/fling themselves can no long use it for corrections afterwords. What I meant is that previously you could use grapple after recovering 50% total energy (one charge); but now you can only use grapple again after recovering 100% energy (previously two charges). So if you use the whole tank you wait twice as long than you used to before can use your grapple again. e.g. 8 seconds with 50% energy to earn grapple capability vs 16s with 100% energy to earn grapple capability. So basically current patch means if you use the grapple for longer you need to wait longer until you can use it again. It also means that you have a slight delay if you keep energy above 50% whereas previously you could instantly use grapple above 50% total energy. Grapple still has a no cost use period if you instantly detach after it grasps a wall, so you're right that the base grapple hasn't changed; but the delay to next use has drastically changed depending upon how you use the grapple. So I can understand the hate for the changes because the delay till next use can be frustrating; but I like it because it means grapple users can't sling shot to bypass participation in wall run chaining game-play like the other tacticals abilities need to do. Allow grapple to be use at all times, but make recharge rate slower. Retain the 100% recharge requirement, but make recharge rate faster. Make it so that the delay is the same time as you use the grapple for, and then it instantly recharges to 100%. First one I feel would allow for too much slingshot exploitation, particularly with a tactikill and power cell pilot; but it would be the most intuitive to user experience. Third one is more changing the display of data than actual mechanics. Seeing you have 80% of energy you can't use is frustrating (glass is 20% empty...). Seeing you have 2 seconds left till you can use grapple again is exciting (Glass is 80% full!). Be interesting to see what Respawn decides to do for November December balance patches! It was not 16s cooldown total. It was a 16s cooldown per charge. My suggestion would either be a) return grapple to 2 charges, however grapples take charge from the entire bar, rather than 1 or b) Grapple disconnects automatically once you use all of it, and each grapple uses up to 90% of the bar with a minimum activation of 10% to throw a grapple. Was just using your numbers to illustrate my point that using whole grapple means you wait double the time to use it again than previously. I find our suggestions are similar just we use different language. It's hard issue. I really don't think the mechanic needs changing but players minds need changing but that's harder to do. It's hard to tell people hey stop swinging like spiderman all the time and use it more conservatively; it'll help you play with others better. They just go "but swinging is the best part of the game, I want to do it all the time!" @OdysseyHome How is 10 double 16? Using a full charge prenerf did have a longer wait time than it does now. Personally, I think the nerf was deserved. So many people reason that overused is not overpowered. Yet for some reason, I don't think the majority of the community is suddenly going to break one of the major occurences of long life games where players will shift towards what's most powerful. The difference is that while grapple was better than other choices, it was more fun. Grapple was basically the Rx-01 of tacticals, except it was as enjoyable as a Charge Rifle kill to use it well. Not talking about time to recharge but time till grapple is available to use. With the prior two charge system if you had the bottom charge full you could use grapple when you wanted; but dip into the bottom charge energy and grapple is disabled untill you gain the base charge back. This is the same as saying each charge is 50% total grapple energy, and to regain the ability to use your grapple you need to have more than 50% energy. With the new one charge system, grapple only becomes available to use at 100% energy regardless of how much energy used. So if a play uses their entire grapple energy previously they only had to wait to 50% total energy to use grapple again. Now they need to wait to 100% to get grapple again so that's double wait time; which is fair penatly for doing a slingshot. Now player needs to wall run chain to preserve momentum like every other tactical. So using numbers say time for complete cooldown was 10s. Then previously only had to wait atleast 5s to grapple again to get to the 50% total energy checkpoint. Now using the whole tank you have to wait 10s to use grapple again. The other thing is that you lose the "use any time you want" above 50% total energy. Now you need to wait for the 100% for the disabled grapple status to reset. Means you have a slight delay after using grapple which previously wasn't present. So i like the change from a meta point of view; but the delays introduced take a while to get used too. It means people need to master base movement more now, skills which grapplers haven't practiced. So i think make the grapple disabled a fixed seconds after use. Maybe 2.5s. Then after that let players decide if they want to wait to recharge more grapple energy or use what they've recovered now. It'd give people more sense of control. Probably balence this capability with a slower recharge rate. So we agree its a good change but it feels weird. I think most issues are due to the variable grapple disabled peroids. Hope i made more sense this time. @OdysseyHome It's 16s per charge pre nerf. That means if you depleted your whole bar, you would have to wait 16s to get 50% of total charge (or 1 charge). Not 16s to get 2 charges. Now, you have to wait 10s for a charge. 10 < 16 is what I was saying this whole time. Trust me, I know how grapple pre-nerf works. That's what my 2nd comment was technically about. The question is if Respawn can implement code to break grapple on its own. If they can't, a meter system would have to be thrown out the window, in which case the best way I see it working is the 2 charge method but have grapple consume from both charges rather than only one. I find our discussion articulates how confusing the charge system can be; hence why i use total % in my comments. Were basically saying the same thing, now i see it was 16s per charge. Not really sure what the grapple break and "use from both charges" suggestions mean. Could you give an example. I'd prefer if all tacticals had just one charge for consistency and sense. Since the grapple is basically akin to a jet pack i'm thinking people kinda expect similar gameplay. Multi small burst for control and distance vs solo big burst for vertical thrust. Changes make multi burst more infrequent which is what i think most grapplers are begruding. It will be interesting what Respawn does to address the backlash. You know how hitting Tactical again or crouch while grapple will cancel it? That's what I meant by grapple breaking. As for the "take from both charges" thing, prenerf grapple as you recall had 2 charges. However, grapple would only consume 1 charge max, or 50% of the total bar. I'm suggesting that it goes up to 100%, meaning you cannot chain 2 slingshots together and the so-called "small adjustments" people used it for will still allow you to keep using grapple. I get what your saying now about the 'use both charges' after watching a video to help visualization, the bar would drain to 50% threshold, then stop while your still grappling so you have another 50% energy to use immediately afterwards... That 'free grapple' time should dip into the energy reserve, I completely agree. Though I really hope they don't go back to a two charge system. Just make all tactical abilities one charge for consistency. I just find it weird that the game presents grapple energy as 'fuel' so you'd assume you could use grapple as long as you have fuel to burn... But what you actually get is a 'pseudo-action potential' where you need to recharge to full capacity after every use. I feel like if they removed the 100% mandatory grapple reset most of the issues people have would disappear... Then to prevent back-to-back add a brief grapple delay after a grapple use. This way you don't feel so vulnerable now after using your grapple. Other considerations that aren't that necessary maybe to reduce the grapple length and increase the pull rate / force. The longer the grapple length allows for more energy transfer into a slingshot so reducing it would limit slingshot potential; but limit using the grapple's use for hi jumping. You could then slightly increase the pull rate to compensate because to grapple tall buildings players would have to use double jump before grapple (so the grapple would have a more 'yoink' behaviour). It's strange that TFall2's approach to grapples is a more slow reeling winch rather than something that quickly pulls you towards the attachment point. Lost Planet also had a interesting grapple system that allowed for wall jumping and VS rodeo moves... I feel like maybe that approach to grapples might have been a better choice.